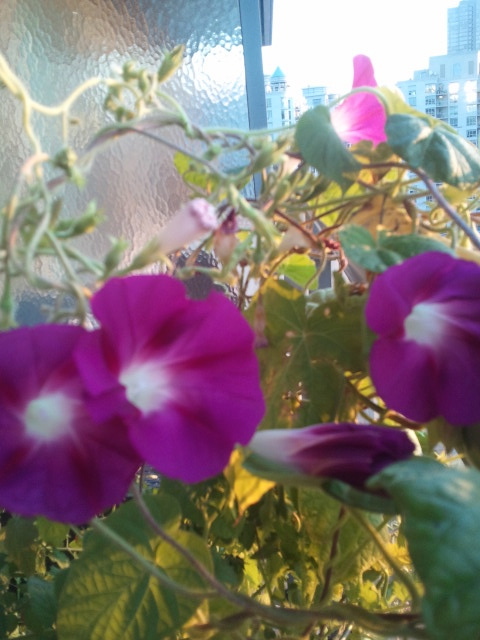 The Morning Glories on my balcony wake up earlier than I do each morning. They look like they’ve been up for hours primping and preening, every bloom a study in perfection. I’d be jealous if I didn’t know they too will be drooping with exhaustion by supper time. All that early morning energy consumes this diminutive vine. It really does live true to its name, looking glorious in the morning, dejected by evening. Some Morning Glories wake up more quickly than others. I appreciate the effort, especially since the vine grows up from a pot just outside my kitchen window. I see the flowers first thing in the morning since the window is next to the coffee pot. Invariably, after I’ve set the coffee to perking, I wander out to the balcony to count the blooms and admire their burst of energy. This morning there were 10 at first count but then I realized there were a couple of shy blooms still curled up as if they’d yet to awaken. Morning Glories look like they are wearing striped pyjamas before they fully give themselves to the day. Once they are up and about, though, nothing but a dazzling pink or blue ball gown will do for these ladies. I identify with Morning Glories, not because of their attire (I’ve never owned a ball gown and doubt I ever will) but because they put out their best effort early in the morning. This has also been my pattern. One of the unexpected benefits in my move from New Brunswick to Ontario was that I switched time zones and, in a sense, gained an hour. When I lived in the Atlantic Time Zone, it had become my habit to rise at 7 or 7:30 a.m. When I moved to Toronto, my biological clock refused to adjust itself to Eastern Daylight Time, so my natural alarm now wakes me up at 6 a.m.
I’m less perky than the Morning Glories, but I’m still up. I’ve never had much difficulty getting myself out of bed in the morning, although there are days when rolling over and shutting my eyes against reality seems like the best plan. I gave up using those ultra-fleecy sheets on my bed because they were simply too comfortable an entrapment. I had dinner with a friend this week who, in order to catch an early morning train, set three alarm clocks and still needed her husband to give her sleepy self a gentle shake. I wake up to the CBC radio, preferring news to music as the first sounds if my morning. Once I’m up, the morning has always been when I do my best thinking. For years I’ve been rising about 90 minutes before I need to report for my paying job so I can spend some time working on my soul. There’s no monetary value in this, but the benefits have been priceless. My early morning follows a pattern. It requires a chair and table, preferably near a window with a view of nature. A pot of coffee is a necessity, and since I am certain to consume more than one cup, I’ve resorted to brewing it partly with decaffeinated beans. 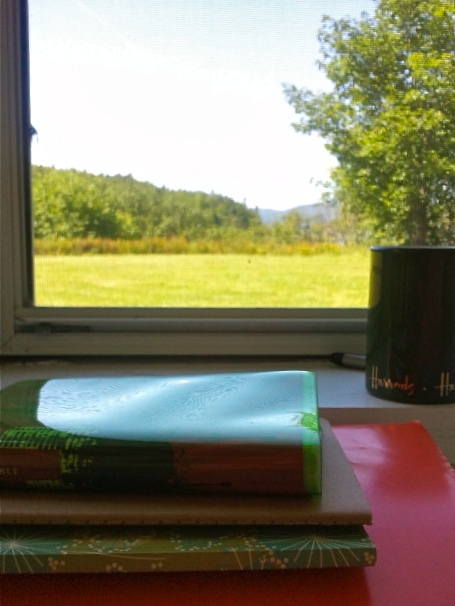 Give me with a window with a view and I will be content. I begin my morning meditation by reading a chapter from a thoughtful book, one that helps me deepen my faith in God, my understanding of humanity, the things that need to change in myself. Most recently I’ve been reading a book called Made for Goodness, written by South African Bishop Desmond Tutu and his daughter, Mpho Tutu. I follow this by reading from the Bible, almost always beginning with a Psalm. This collection of Hebrew poetry has become as important to my morning ritual of awakening as my cup of coffee. The coffee stirs my brain; the psalms stir my soul. As I read and think, I also write, scribbling quotes from the book I’m reading, verses from the Bible and my own musings across the pages of a journal (preferably unlined). These journals have piled up around me since my high school days. Every now and then I revisit them, coming back to earlier versions of myself to chart what needs adjusting, and what I’m happy to keep. A few of my favourite morning companions. After I read and think, I pray. Sometimes the prayers are quick and urgent; sometimes they are long and thoughtful. Sometimes I write lists of things I want to bring to God’s attention (audacious, I know, but I learned this from the Psalms). Sometimes I follow liturgies. I spent one whole year praying daily through The Lord’s Prayer. 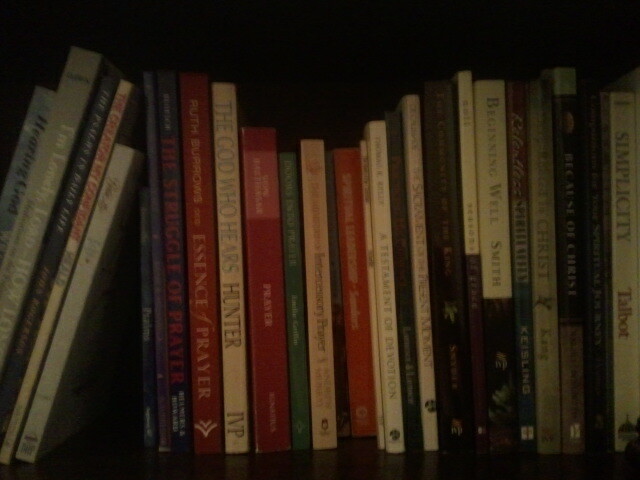 I have books of prayers written by others who sometimes provide the words that escape me. Nutritionists tell us that breakfast is the most important meal of the day. I believe this is true. But I’ve also come to believe that feeding one’s soul in the morning is equally important to feeding one’s body. 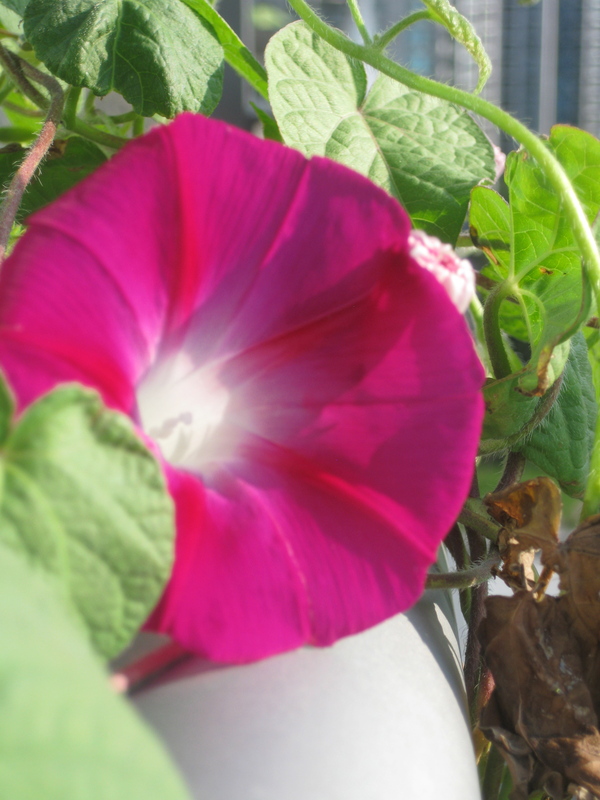 Lately, the Morning Glories on my balcony have been part of my morning feast. I’m grateful for that. Lynda MacGibbon is a transplanted Maritimer living in Toronto. This column is published each Friday in the Moncton Times & Transcript. Contact her at lmacgibbon@gmail.com and follow her on Twitter @lyndamacgibbon. Thanks for the reminder Lynda, after the circumstances of my last two weeks this is the nourishment that I need. Lynda, I still remember you coming to MACF and giving a talk on this very same thing! Thanks for sharing. I enjoy reading your posts. Thanks, Lindsay! Glad it brought back a memory! I appreciate hearing the glories of your morning ritual. 😉 Aren’t you glad to be one of the morning people? Absolutely….at least in the summer!